The Christmas season is upon us and Santa is on his way. But, the oldest American Santa was only recently discovered. Under piles of dirt and debris in Akron, Ohio, archeologists make a fascinating discovery buried for over 100 years. It was the site of an old toy factory, the place where the first toys were mass-produced in 1884. Before this time all toys were hand-made and so expensive only the world's wealthiest families could afford to buy toys. With the introduction of mass-production, for the first time in history, all children could have toys. So when archeologists found the oldest three-dimensional image of a Santa known to exist, at the site of the first mass-produced toy, that's the real Santa -- a metaphor on the miracle of mass-production -- and that makes the site, now a green park, the original North Pole. Oldest figurine of a Santa, circa 1894. Discovered at site of an old toy factory in Akron, Ohio. This company mass-produced the world's first toys. "The Blue Santa is a 'Wishing Santa.' You hold him in your hand and wish for the present you most want for Christmas," said Michael Cohill, Director of The American toy Marble Museum in Akron, Ohio. Santa's coming to town! You'll see him in parades, at the local malls, dressed in his fancy red and white suit, the traditional Santa suit we all know and love. But that's not Santa's original suit or colors. At one time, a long long time ago, Santa wore a different suit. 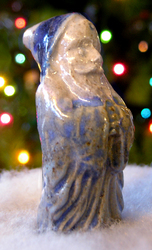 Archeologists working in the heart of downtown Akron, Ohio found the oldest known figurine of a Santa discovery and he's dressed in blue. They found him among thousands of old marbles and penny toys found at an old toy factory that burned to the ground in 1904. With the help of Brian Graham, an archeologist formally employed with the federal government and with permission from the City of Akron, the site unearthed a secret that Akron had been hiding for more than 100 years. Graham found a small figurine of a bearded man with a blue hooded coat, no more than two and one half inches in height. “Shhhh, the secret is,” Michael Cohill, director of the American Toy Marble Museum, touches his finger to his lips, “we found Santa.” Cohill’s blue eyes twinkle like the small Blue Santa he holds. Doing extensive historical research for eight years, Cohill and Graham discovered the significance of the Blue Santa and how it was made. Cohill is now using those same, somewhat crude, mass-production methods to make reproductions of the Blue Santa. Today the archeological site is Lock 3 Park, but in 1884 is was The American Marble & Toy Manufacturing Company, site of the world’s first mass-produced toys -- clay marbles and penny toys. “Marbles were made using a device patented by Samuel C. Dyke, founder of the company. It allowed one worker to make 800 to 1,000 clay marbles per hour; turned out at a rate of one million marbles a day, five box-car loads, six days a week. "So significant was the economy of scale, that one penny could buy a handful of marbles or dozens of different penny toys. The Blue Santa was a penny toy,” says Cohill, gingerly cradling the original Blue Santa in his hand. “This was the birthplace of the modern toy industry,” he adds. Before Dyke opened his company, there were only hand-made toys, beautifully painted, clever in design and so expensive only the world’s wealthiest families could afford a toy. By 1888, Dyke was well on his way to becoming a millionaire. He had, in essence, created ‘the children’s product market.’ He knew, if you mass-produce a toy that children like, it becomes so inexpensive that even a child could buy it with their own money. “From that point forward, all children could have a toy,” says Cohill. This fact was not lost upon other Akron area businessmen, who were watching Sam Dyke’s success. They started 31 additional toy marble factories. On the other side of Akron, entrepreneurs were seeking new uses for rubber (Akron was once know as the ‘Rubber Capital of the World’). They began mass-producing balloons, rubber balls, rubber duckies, rubber dollies and rubber baby buggy bumpers. In total there were 160 local toy companies in Akron. Today, the area is still a major toy-manufacturing center with companies like Little Tykes, Step Two, and Maple City Rubber (still the world’s largest manufacturer of latex balloons). Cohill goes on to say,“ When archeologists working at the site of the first mass-produced toy, the birthplace of the modern industry, where from that point forward all children could have a toy and they found Santa there, well then this Blue Santa is the real Santa (a metaphor on the miracle of mass-production) and we've discovered the original North Pole." The Blue Santa is still on site at Lock 3 Park, housed in a display case at The American Toy Marble Museum. NOTE: The red and white suited Santa we know and love today was created in 1931 by an artist named Haddon Sundblom while working for the Coca Cola Company. Convinced that Santa needed a makeover in the appropriate red and white corporate colors, Santa’s blue hooded cloak look from the old German tradition of 'Father Christmas' was replaced. 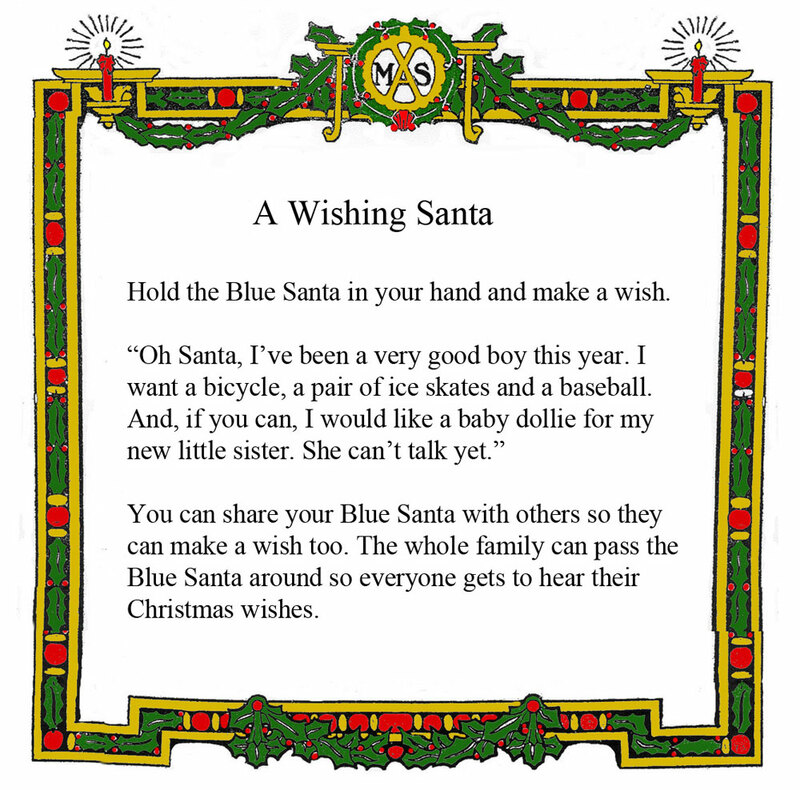 For additional information about the Blue Santa, or the American Toy Marble Museum contact Michael Cohill 330-396-1670 or visit http://www.BlueSanta.us where replicas of the Blue Santa can be purchased.